Scientists from the Fraunhofer Institute for Laser Technology ILT in Germany are developing a 3D printer integrating both stereolithography (SLA) and multi-photon polymerization (MPP) for the speedy production of high-precision polymer structures. The project “High Productivity and Detail in Additive Manufacturing through the Combination of UV Polymerization and Multi-Photon Polymerization – HoPro-3D”, ultimately aims to build a machine capable of producing branched microtubes and complete microfluidic devices. Currently, the HoPro-3D project includes LightFab, an Aachen-based 3D printer manufacturer, Bartels Mikrotechnik, a specialist in microsystems technology, and Miltenyi Biotec, a manufacturer of biomedical research tools. A macroscopic 3D printed structure. photo via Fraunhofer ILT. In November 2018, Fraunhofer ILT scientists launched the HoPro-3D project to create a new machine for manufacturing macroscopic polymer structures with a resolution down into the submicrometer range. This will accelerate the production of biomedical components, such as 3D printed cell scaffolds. However, MPP is said to produce finer structures as the “necessary photon energy is generated by intense laser pulses with wavelengths in the visible or infrared range.” As a result, the researchers are combining SLA and MPP process with a 3D printer with two selectable exposure systems for either high build rates or high precision. Presently, the partners are using high-performance LEDs emitting at 365 nm wavelength and a DLP chip with HD resolution for lithography. 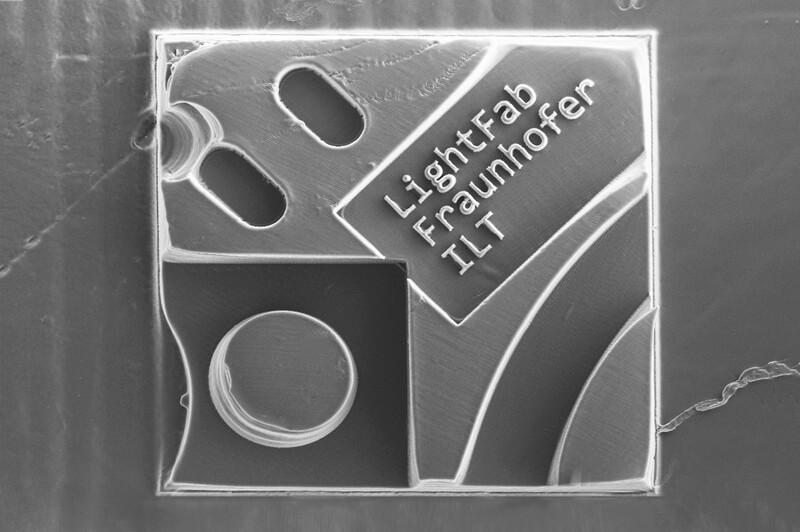 Furthermore, the MPP module in the developing additive manufacturing system uses a femtosecond laser with a fast scanner and microscope optics. A fine structure (approximately 400 x 400 μm) produced with the new process combination and attached to a solid base. Photo via Fraunhofer ILT. “The advantage lies in the interplay between the two procedures: Depending on the need, we intend to switch between the exposure systems in the process,” said Dr. Martin Wehner, HoPro-3D project manager at Fraunhofer ILT. Control software is also in development which shall use CAD data to independently decide on when a change between the two processes is needed. This will enable a 3D printed structure to be built in the same resin vat, regardless of the process. Fraunhofer ILT is part of the Fraunhofer Society’s 69 applied science research institutes across Germany. Last year, the institute presented its first prototype additive manufacturing system using TwoCure, an innovative support-free SLA-based 3D printing method. Prior to this, scientists at the Fraunhofer Institute for Manufacturing Engineering and Automation (Fraunhofer IPA) developed a new hybrid 3D printing method with injection molding, known as Additive Freeform Casting (AFFC). This was designed to save manufacturing time as well as encourage the use of new material combinations. Remember, nominations for 3D Printing Industry Awards 2019 are open. Let us know the enterprises, technology and individuals leading the additive manufacturing sector. Also, subscribe to the 3D Printing Industry newsletter, follow us on Twitter and like us on Facebook. Featured image shows a fine structure (approximately 400 x 400 μm) produced with the new process combination and attached to a solid base. Photo via Fraunhofer ILT.